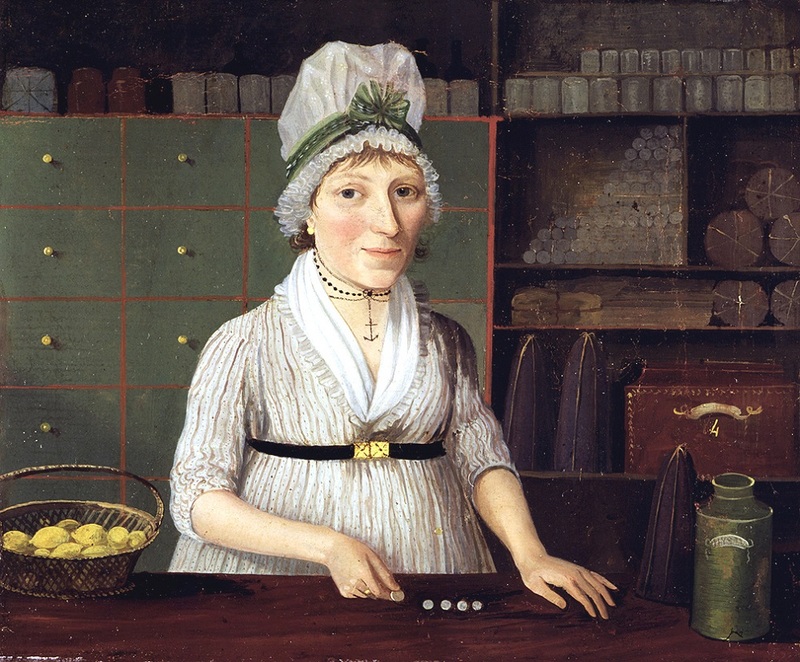 A Woman Shopkeeper of the 1790s, by an Unknown Artist. Everything indicates that, should need arise, there was nothing in the social or economic code of the times to prevent a woman's supporting herself and her family in whatever way she best could. ... As far as general business went, women were to be found buying and selling, suing and being sued, acting as administrators and executors, and having power of attorney, with what appears to be the utmost freedom. Recent historians have little changed Elisabeth Anthony Dexter's seven decade old conclusions. Women clearly played an important role in the colonial economy. Besides farmers and housewives, colonial women were innkeepers, "she-merchants," artificers, health care providers, teachers, landed proprietors, writers, and printers. Women were also shipbuilders, tailors, shoemakers, bakers, brewers, painters, gilders, and wallpaper hangers, among other occupations. Colonial women most often made a living in occupations that stressed their traditional female roles as mothers and housekeepers. But the monetization of even the most feminine of occupations transformed "women's work" into a component of the gendered game of wealth accumulation. Women inn and tavernkeepers had to take money and promissory notes from their customers in order to pay their suppliers, for example. The operation of a public house necessitated the hosting of public functions, especially legal and economic ones. Vendues, for instance, were commonly held at taverns, even those owned by women. Seamstresses often developed into milliners and mantuamakers -- fancy seamstresses who resold a stock of value-added goods. Widows and single women could not help but gain a familiarity with finances. In fact, William Dawson ran "an evening school for young ladies" in Philadelphia in 1755 that included instruction in "arithmetick," and "accounts, by way of single entry, in a plain methodical manner." According to Dexter, "women shopkeepers abounded in colonial days, not only in New York, but throughout the northern colonies. They excited little comment, and received scant mention in the earlier sources." Because she-merchants often took over the businesses of deceased husbands, colonial women sold a wide variety of goods from windows to clothes to wines to groceries. A few women were dry goods importers, the top of the colonial and early national merchants' ladder. One of these was Mary Alexander, the mother of Lord Stirling of Revolutionary War fame. She was a powerful New York City merchant of Dutch extraction. From the 1720s to the 1760s, Alexander lived the life of a wealthy merchant. Worth some £100,000, Alexander dealt in bills of exchange, especially with Barclay and Sons, her bankers in England. Other colonial women traders were furniture dealers, hardware traders, booksellers, druggists, and tobacconists. Some she-merchants specialized in certain goods. Clothing and seeds were favorite areas of concentration. Women came to dominate certain trades in some areas. For example, six of Boston's eight major seed retailers in 1774 were women. Although the words "for cash," or "for cash only," frequently appeared in the advertisements of colonial she-merchants, it is clear many women merchants allowed credit. Women shopkeepers were able to extend credit, it appears, because they were able to get credit directly from Britain. But, like their male counterparts, their credit was not unlimited, and they often had to dun debtors for payment. Women's dunnings were firm. One such dunning bluntly stated: "if not convenient to pay the money, to come and bring surety and change bonds into negotiable notes of hand ... and those neglecting will be sued in the December Court." This she-merchant needed cash, and was willing to resort to the private securities market, or the courts, to get it. Women shopkeepers also made their own promissory notes or assigned their debtors' notes to their creditors for collection. There remains some disagreement about the number of colonial women involved in trade. Elisabeth Dexter estimated about one out of every ten colonial merchants was female. Jean Jordan believed only 2% of colonial New York merchants were women. While admitting "the percentage of eighteenth-century colonial shopkeepers who were women is not clear," Patricia Cleary, who relied on tax records as well as advertisements, thought as many as one in every three shopkeepers were women. While Jordan found only 106 women traders in New York between 1660 and 1775, Cleary found 109 in the 1760s alone. Historiographical disputes grow more fundamental with the closing of the American Revolution. Several historians who believe the Revolution should have extended women's political rights have tried to explain why women were politically proscribed in the early national era. Although a reduction of the number of women in business, or a large increase in women's political involvement, would have been counter to colonial trends, these studies often also imply women's economic activities were similarly proscribed. That was simply not the case. Whether or not the reaction to women in politics during the early national period was "Thermidorean," or "a deeply gendered one," women continued to play an important role in the early national economy. Most men, in fact, did not find "it impossible to imagine adult women as anything other than wives." Jean Jordan wrote, with some degree of truth, that after the Revolution, "the colonial type of women merchants -- importer, exporters, wholesalers -- were gone." However, as will be shown below, it is clear that many women traders, though generally of a lesser sort, continued to prosper well after the Revolution. An analysis of Longworth's Directory for 1803 suggests that about 7% of New York City's "traders" were women. Of the Directory's approximately 12,250 names, 1,468 were sampled by manually assigning persons with last names beginning with an 'A' or a 'B' into one of six categories: male trader, male mechanic/laborer, male professional, unidentified females and widows, female trader, or female laborer. Male traders included merchants, grocers, shipmasters, shipchandlers, milliners, tavern or innkeepers, and any man owning a "store" or "shop." Such men composed 30% of the total sample. Male mechanic/laborers included carpenters, butchers, bakers, pilots, cartmen, oystermen, laborers, painters, masons, coopers, shipwrights, tailors, smiths, and others who probably worked primarily with their hands. Such men composed 50% of the total sample. Male professionals included doctors, lawyers, teachers, measurers, corporate officers, architects, constables, and a wide assortment of government officials. Such men composed 8.5% of the total sample. Widows or occupationally unidentified women composed 7.5% of the total sample and 71% of listed women. Female merchants included merchants, milliners and mantuamakers, tavern or innkeepers, and a few teachers and nurses. There were so few of these last groups that their inclusion in the traders group is not statistically significant. These traders (and the few "professionals") composed 2% of the total sample, 21% of the women's sample, and 7% of the "traders" sample. Female laborers included seamstresses and washers. They composed less than 1% of the total sample and only 8% of the female sample. Undoubtedly Longworth's compiler missed many of this last class, or listed them without occupation. Frances Manges thought the increased complexity of the economy explained "the reason women were accepted in business more readily before the Industrial Revolution than after it." She thought "that the [colonial] economy was so simple that the shop, tavern, or craft could be conducted from, or not far from, the sanctuary of the home." In other words, the movement of economic activity from the home presumably made women's work less socially acceptable. Mary Beth Norton laid the blame on "the republican definition of womanhood." "Woman's domestic and maternal role came to be seen as so important," Norton argued, "that it was believed women sacrificed their femininity if they attempted to be more (or other) than wives and mothers." Many historians writing in this vein have focused largely on upper class women. Recently, Jeanne Boydston has noted this, and questioned why labor, economic, and even women's historians ignore early nineteenth-century lower-class women. Indeed, most women traders, as Mary Roberts Parramore has shown, were of "the laboring class." Her careful study shows that the number of women traders in South Carolina actually boomed after the Revolution. Lisa Wilson, Life After Death: Widows in Pennsylvania, 1750-1850 (Philadelphia: Temple University Press, 1992). Pennsylvania Gazette, 25 March 1755. James A. Henretta, The Origins of American Capitalism: Collected Essays (Boston: Northeastern University Press, 1991), 237.